I’ll bet you are a good fastball pitcher, but you just can’t seem to find a good change-up to mix in with your fastball. Now it is time to learn how to throw a cutter. You’ve heard about the pitch Mariano Rivera (the great reliever of the New York Yankees) throws to gets batters out and you want to learn more about throwing a cutter like his. With the success he has I don’t blame you. The cutter, also called a cut fastball, is a fastball with movement, not a breaking pitch. It will only be a few miles per hour slower than a fastball, and it should have a slight late break. Hitters may hit a well thrown cutter, but usually only with the bottom of the bat. A harmless groundball is the expected result. 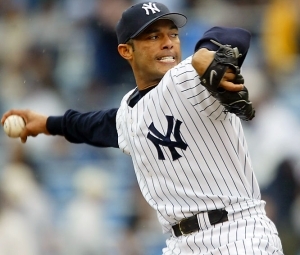 Mariano Rivera throws a nasty cutter, which is why he is headed to the Hall of Fame. And his cutter is so good he can throw it from the start of his appearance. For most pitchers they first need to establish their fastball, and then mix in the cutter. Since the cutter looks like a fastball for about 58 feet, the hitter will loaded up and swing just as the baseball dips down and away or into them. It’s a swing and a miss or harmless dribbler. Learning how to throw a cutter should also include learning when to throw a cutter. The fastball may be working and you are hitting your spots. But good hitters will adjust and start to pick up the timing needed to hit your fastball. This is when the cutter, or a good change-up, will be most effective. Like I said above, the cutter looks like a fastball to the hitter, and the late break allows him no time for adjustment. 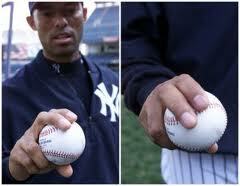 There are different variations of a cutter or cut fastball pitching grip. So as it goes with most pitches, learning how to throw a cutter means playing around with different grips. The cutter is more like the fastball than any other pitch, so start out using the four seam fastball grip, only move the grip a little off center. Your thumb comes up just slightly on the inside of the baseball, and the index and middle fingers rotate just slightly to the outside. Upon release you will put most pressure on the ball with your middle finger. If you are not getting any break with this grip, then move the thumb back down directly under the ball. If there is still no movement, then twist the wrist upon release ever so slightly. Much twisting at all will turn the pitch into a slider. Remember to apply the most pressure with the middle finger. Usually when people talk about how to throw a cutter, they think that the term cut fastball is one and the same. But there are some baseball people who think that a cutter is thrown with a four seam fastball grip, and a cut fastball is thrown with a two seam fastball grip. So we will refer to the cut fastball as thrown with the two seam grip. Again, like the cutter, the grip is held just slightly off center away from the body. And upon release the most pressure is applied with the middle finger. The arm motion and arm speed for the cutter are just like for a fastball. You are coming over the top with a good stride and letting the baseball fly. At the point of release, with the grip slightly off center and pressure from the middle finger, turn your wrist ever so lightly. This off center grip and slight turn of the wrist will result into a pitch with lots of velocity and a late downward break. Would you like to be the hitter trying to hit this? Me neither. Good luck and practice hard.